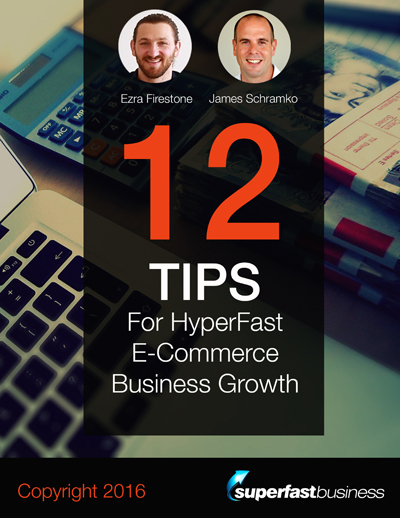 How does an e-commerce business leap to almost 10x revenue in the space of a year? James Schramko and Ezra Firestone examine the strategies and practices behind the amazing boom of Boom! 48:12 – Case study, what would you do? 48:44 – Are all customers equal? James: James Schramko here. Welcome back to SuperFastBusiness.com where I’m bringing information to you. I especially love this podcast medium. One of my other podcasts is called ThinkActGet, and my co-host there is Ezra Firestone. Today, we were going to record an episode of ThinkActGet, except we decided that what Ezra told me before that was far more compelling and we should make a podcast for this show for you because what we’re going to talk about is phenomenal, nothing short of phenomenal. Welcome to this podcast Ezra Firestone. Ezra: Wooh! Ezra in the house. I just wanted to say that about myself. So thanks man, I appreciate it. James: Alright. So we have Ezra in the house. This is going to be weird for some of our regular listeners from the other show because they’re going to hear us having a more concentrated business chat today. James: A few less groundhogs. Ezra: Yeah. If you’re a ThinkActGet listener, then you know we get out there. This will be a little more tactical. James: We do. Less bananas, less groundhogs, more businessy stuff. Now Ezra, I’m about to fly over to see you at your event in San Diego where you have assembled on a little bit of a brains trust on topics that are of interest to your audience, and I appreciate that you’ve asked me to present on a topic of team building. You’ve certainly been needing to build your team, because the core of this episode is about hypergrowth, and in particular, you’ve shared with me some information that you’ve got three main businesses that are on your focus, and two of them in the last year doubled, which is fantastic in itself. But one of them, I think it was nine or 10x, and it wasn’t a small business to start with. In fact the figures, I don’t know if you mind me sharing this Ezra, but you’ve gone from somewhere in the region of $4 million revenue to $25 million dollars revenue in a one-year period in the not too long ago. Is that right? Ezra: Yeah. It’s been nothing short of incredible. It’s kind of everything that you always think about. There’s this sort of phase of business where you start, and then you make your first couple of thousands, then you have a hundred thousand dollar a year. I remember my first hundred thousand dollar a year, I was mind blown. I could not believe I had actually made a hundred grand. And then maybe you get to seven figures if you’ve reached that level. And then there’s always, you sort of imagine what it might be like to scale your business even bigger. This particular business that has scaled that way has been around for six years. We actually just had our sixth year anniversary. So it was the fifth to sixth year that we’ve seen that kind of growth. It’s been incredible on so many levels. Something interesting about it is that it’s also come with added responsibility. There’s a lot of pressure because I literally at this particular moment in time have $1.5 million of my profit of money that is invested in inventory, sitting in a warehouse that I’m on the hook to sell. So the stakes are a lot higher. I’ve got 40 people’s salaries, and their children, and everyone counting on this thing. So there’s this added level of pressure as well, so there’s this huge upside and all this amazing fun stuff that comes with it. And then there’s also an intensifier of responsibility. James: Well you know that great Spiderman saying. Do you remember what it is? James: [laughs] I can always rely on you. Ezra: Oh yes, I remember. Ezra: Ahm, with great power comes great responsibility. James: Yes. Now what happens if you reverse that? Ezra: I don’t know. Why don’t you tell me? Oh, I got it. With great responsibility comes great power. Man, has there ever never been said, never anything that is more truer been said? The more responsibility you’re willing to take for your life, the more agency you have. James: That’s it. I know what it’s like to have a whole bunch of people depending on your business. I had over 60 people in the business at one point, and it is a responsibility. But also, when you’re buying 60 people’s worth of time and directing that to the market by solving a real problem, you can do so much with that. You can really have some impact. Now you’re actually selling a real product. That’s one thing I love about the conversations we have. This is not airy-fairy electrons, or ideas, and stuff, which is fine. I mean I sell ideas. It’s one thing that I really have excelled at. You’re selling stock. You actually have a physical product for this business that changes lives as well. Ezra: Yeah. You know what’s unique about our products, I think, is that we don’t do the typical, physical product markup. Maybe we should, but typically what’ll happen is someone will manufacture or purchase, in our case, we actually manufacture ourselves. We’re not buying from overseas. We sell skin care, and so we’re actually manufacturing that in our own manufacturing facility. But what a lot of people will do, especially in the supplement space, and in the electronic space, and a lot of these spaces is they’ll mark their product up between five and 10x. So to cost them five bucks for a bottle of pills, which I don’t sell ingestibles or supplements, and then they’ll sell that for $75. So their margins are crazy. We only mark our stuff up 3x. So we create for 10 and sell for 30 basically is our formula. I think for e-commerce today, that’s the minimum markup that you can have and actually make an ad model business work. You need to markup at least 3x, or you can’t actually make, in my opinion, an ad model business work in the physical product space. If you’re marking up four and 5x, you know hey, more power to you. But that’s just not our strategy. James: And where is the other x going? I mean I hear stories with e-commerce that might make it 20 or 30 percent profit margin, but that’s not the other 2x. There’s an x missing, right? Where is that going? Ezra: Yeah. So there’s cost of goods, which will be 30 percent, right? Ezra: And then there’s all of our marketing cost – advertising, content creation, salary, team, and that eats up a huge portion of our revenue and profit. James: I’d say that would be the danger zone for a lot of businesses, wouldn’t it? Ezra: Absolutely, absolutely. And it’s being able to measure that and kind of know what you’re doing. James: So if you’ve got one and a half million dollars’ worth of stock, how much do you have right now on the hook for advertising? Ezra: Explain that question one more time. Oh, how much do I have to spend to sell that one and a half million dollars? James: How much have you spent right now where you haven’t yet got a return assuming that there’s some kind of a lag between when you spend the money and when the customer delivers a payoff for you? Ezra: Sure. There is a significant lag. We’re probably 500 grand, 600 grand. James: Right. So as your business grows, your appetite for advertising will grow too, accordingly. Ezra: Well I understand now why people take capital. I always used to tell people it would be dumb to take money from someone else because why would you do that? Then you have to give them a percentage of your business, you have to pay a loan. But like at this level of the game, I really understand why people take capital, because it’s a lot of pressure if you’re spreading that yourself, if you’re handling that spread between the time that you spend in advertising. James: Well it just means you might have to go a little slower if you’re reinvesting your own capital. Ezra: Yeah. We’re spending in the neighborhood of 15 to 20 grand a day on just ads. James: Right. And that would normalize for you because you’re seeing sales coming in that you probably started marketing to some time ago. And I think we should probably zoom in on that. What is the delay that you would be comfortable with from when you spend the money to when you can get a return back on that dollar? Ezra: I am literally looking at a 60 to 90-day period from dollar in to dollar out. James: Now this would probably be interesting for someone starting out because a lot of the suffering that I see when people start advertising, and I had someone say this to me last night actually at a local meetup that we hold for SuperFastBusiness, he told me he was running some ads but he’s got to stop them because he’s not making his money back, and I asked him how long has he been running them, and he’s like, “I’ve only been running them for a very short time.” And I said, “Hey, I don’t know if you realize, but most of the time when you start an advertising campaign, you are going to lose money in the beginning while you figure out which things work. And even then, sometimes, because of competition, or ad costs, or what have you, you won’t even make the money back on the first sale. It might take an email sequence follow-up, or some cross-selling, or some remarketing until you can break that even dollar back, but over the next phase is when all the profit comes.” And that’s when the competition, they’re very strong, right? They’ve been in the market longer than you. So there is going to be a lag, isn’t there? Ezra: Absolutely. And I think you’ve just nailed it on the head, which is that my viewpoint is if you’re in the physical product space, I don’t know about the information space because that’s not really my main business model, but if you’re in the physical product space or services space, and you’re not selling like super, super high ticket stuff, and you’re leveraging advertising, which is my favorite way to do it, to generate your visibility, then you’ve really kind of got to be able to offer more than one offer on the table. Because if people are following you James, and they’re doing even half of what you’re telling them, then they’re going to be able to reconvert people who buy like at a 10 percent to 20 percent ratio. So they’re going to be able to get people who buy to convert again on another offer they make to them, one or two out of 10. So if you’re looking at that, and that’s why I look at a 90-day window. James: Well if they’re following me, there’s a good chance they’ve dialed some subscription into the mix. Ezra: Yeah, that’s even better. James: They’re probably getting paid on a really high frequency because of all the parts of the profit formula, that’s the one I dial in the most, there’s two things I go for. I’m really keen on frequency and conversions. There’s been a lot of talk in the marketplace at the time of recording this about conversions, and in particular, relevancy and segmentation. If you can dial those in, then you’re on track to get your money back a little sooner. If you can dial in frequency, like if you deliberately engineer a way that someone can buy from you again, it could be simply in the form of a subscription, which is like gold. It could be that you have an elaborate marble run of behavioral and action-based logic that looks to see what people have sold, see what they haven’t bought, and making them relevant, specific offers at the right time. But this is all about making sure you get your dollar back at some point, but you’re going to need some elasticity on when that will happen. I guess in the beginning Ezra, you didn’t know which ones perform, and you probably had to invest some money as a research and development budget to figure that out. Ezra: Absolutely. You’re always going to have to invest upfront to figure out kind of what’s working. What you were just saying about subscription and recurring brought to mind this big story in the physical product space, just happened, the Dollar Shave Club was acquired for a billion dollars cash liquid capital, and their whole model was subscription physical products. They’ve got a couple million people on subscription, and they ended up with like a 10 to 15x valuation. Every time I look at a company, and I look at valuations, the companies that have subscription revenue or proven repeat business, one of the two, end up getting like a double to triple valuation, so what it’s valued at, compared to companies that just have one-off sales. So that idea that you want to be able to get subscription is fantastic. The way that I look at this in my mind is a collection, so when you’re talking about conversion is a collection of conversion assets. And what I call a conversion asset is like a piece of content, a sales page, a webinar, an email sequence, a retargeting, having someone pixeled for retargeting. All these different things that work together in concert to create a conversion or a second conversion. What you mentioned is actually one of the most powerful things that we have in our business, which is “bought X, but didn’t buy Y”. So we have these bought X, but didn’t buy Y campaigns that go out to people based on what they’ve yet to purchase. We got them to actually make a purchase, and then based on what they didn’t purchase; we have a series of conversion assets that goes out to them that make them offers. And the way that we do it is very, I essentially learn this system from you, OwnTheRacecourse, which is a system of amplifying content that engages people in a conversation that then alludes to products or offers that you have. So every one of our conversion assets or conversion funnels starts with a piece of content – a video, an article, or something that then leads to a sales page, or gets you on an email sequence that then offers you a long-form video content like a pre-recorded webinar or something like that. But this idea of offering people things that are relevant to what they came in on has been a huge factor for us. Another big factor for us has been something called anti-defection or winback campaigns. So basically, we know in all of e-commerce, the statistic is that if someone buys from you and they then, you obviously put them on a post-purchase email sequence, which is designed to send them pre-arrival content, so content before the product arrives to get them excited, designed to send them content to generate more conversion assets for you, such as survey responses, video reviews, or text reviews, selfies, or anything, stuff like that. So they’re getting these post-purchase emails. You might be broadcasting all of your buyers with blog content. You’re doing all these things to re-engage them, and maybe make them other offers. So if they are on your post-purchase, they’ve come from you, they’ve come and they’ve bought from you, and they don’t buy again within the first 60 days, you’ve pretty much, about 90 percent of the time, completely lost that person. And now what we’re doing is we’ve actually figured out that if you come in on X product, you’re most likely to buy Y within 14 days. So if you come in on my main product, which is Boomstick Trio, you’re most likely to buy Boomsilk within two weeks. If you don’t do that, I start marketing Boomsilk to you. So this sort of behavioral automation based on the data that I have about how you’re most likely to act has been extremely powerful for us. I know that might be a little technical and a little intense, but if you can simplify it, it’s basically knowing that most likely, if you’re doing legit marketing, if you’re following James Schramko method, and you’re emailing people, and you’re offering content, and still you don’t have a repeat conversion, you can then put together a specific campaign to create that anti-defection campaign, a winback campaign to create that second conversion after the timeline that it’s most likely to have happened. James: Right. On that particular point, two areas I want to go with; one is do you have a “more of the same” campaign? Because I remember seeing a statistic from a very big company, and they said that the thing that beats every other offer, they said firstly, free shipping, they’ve never been able to beat free shipping as a deal, and secondly, more of the same always out-converted a cross-sell for some reason. If someone buys a jar, it’s easier to sell them five more of the exact same jar than the Y.
Ezra: Yes. Then they don’t offer them anything else. Ezra: So what we do actually, for physical products, this is totally relevant, I don’t know how relevant it is for services or information, but we do the post-purchase one-click upsell, where basically after they come in and make a purchase, we immediately make them an additional offer. James: It’s still relevant. I’ve tested it for my event. It’s how you bought a ticket, now how about grab one for a business partner, or a friend, or whatever. Ezra: Yeah. We just make one or two offers. We don’t want to be aggressive. We don’t want to be douchey. We don’t want to make people upset. We actually tested this because we didn’t know. “Hey, you want this? – No.” “Hey, you want this other thing? – No.” “Hey, you want this other thing?” By the time you’ve offered three things, you really upset people. But if you just offer two, if you make one offer and they say no, and you offer something else, or if you make one offer and they say yes, and you offer something else, so two offers before a thank you page, we have never gotten a complaint about those. James: So more of the same really does work. James: Instead of jamming people down one linear path, which was probably the old methods, like they start in this one funnel, step one, step two, step three, a little bit of this then that logic, and then pump, pump, pump, pump out the end, now you’re a little more relaxed because (a) you’ve got some more tolerance about how long you can wait until someone buys from the time you spend the money, and you can do that because you’ve got these conversion assets; the other thing you’re doing is maximizing the value of the customers you’ve already got, which is very, very clever with relevant offers. I’ll just step in here with an example of a bought X but not Y for a non-e-commerce situation, which would be in my case, like an information-type business. I do a very simple X but not Y campaign each year, and it revolves again around my live event. When someone buys a ticket to the live event, we’ll look to see if they’re a member of SuperFastBusiness Membership. If they’re not a member, then they will get sent a trial membership offer because they bought a ticket. They can have access to the membership on a trial basis. Ezra: You do that before the event or after the event? I’m asking because I just sold an event. James: Right. When they buy the ticket, they get an email sequence. It’ll go and look to see if they’re a member or not. If they’re not, it sends them to a special video where I’m explaining to them about how having a membership can support their event experience. For a few reasons why, one – they’ll be able to meet the other people who are coming to the event, they’ll have a format for discussing the event; before the event and during the event, they’ll be able to review the videos from the previous event to get some context and to get a fast track on it; they’ll get the pre-event tips on where people are meeting for drinks, and what to expect at the event. And then after the event, they’ll be able to watch the recordings of the event, which I put in the membership. So it’s a very compelling argument. Ezra: That’s a great idea. James: Right. And they also get 60 days I think for free, and then if they stick around, then it starts billing. I put them on a loyalty rate. It’s a little bit lower than the retail rate. So they get a good feeling each month that they’re paying a little less than the market rate, which is what I call a loyalty lock-in. And that’s saying, “Hey, every month you stay, it’s kind of like you’re winning. It’s like you’re beating the house because you’re getting this discount to market.” So that’s my X but not Y. But I also do the other way around. I go through my membership list, and I have a look for people who haven’t bought a ticket yet, and I’ll follow them up. Because they’re a member, they get a reduced rate ticket for the event. So they get the very first round of tickets at a before market price. Ezra: And people like to feel special. 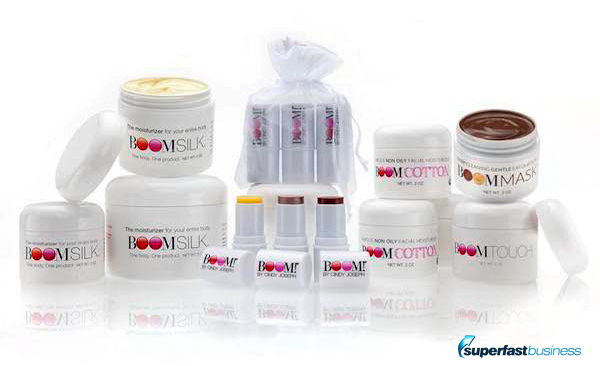 You’re part of our Boom club; you get a discount on new products. James: Here’s the thing, if they’re a member, they’re getting the lowest price for the ticket. If they buy a ticket and they’re not a member, they get a little bit better deal on the membership. So it doesn’t matter whether they’re starting at X or Y, they’re getting a better deal than if they were just to have one or came at it from a public point of view. So because they’re inside of the one, they get a better deal for the other. Ezra: Totally. And I really do feel for scale. If your goal is to grow the business, at a minimum, maybe two is enough. But at a minimum, two different offers, to different physical products, an event and a service, two different services, a recurring thing, right? That would be considered two things. James: My very simple version of the business this year, after selling my SEO business, selling my website business, I’ve now got one non-internet marketing related business on the side that we’ve been cooking for about 18 months, I’ve got the SuperFastBusiness membership, I’ve got the SuperFastBusiness live event, and I’ve got SilverCircle of course, which I’m grateful you’re a member of, bringing these good tips directly to our members. The idea exchange going on in that group, it’s off the charts. We have some incredible members in there who I support and who are doing so well in their business and give me fantastic level of access to be able to ask questions. So I have to make sure I ask you the questions that someone would want me to ask Ezra. What caused you to plateau in the business? Like what made it get stuck for so long and then why did it all of a sudden nearly go 10x? What happened? Ezra: Yeah. So what happened was, a friend of mine, he sits on the board of private equity firms. They pay him a salary, a six-figure salary to be the guy that when they’re considering investing in an e-commerce business, he vets it and says, “This is a good investment or isn’t a good investment.” And then if he decides it is a good investment, and they decide to actually buy this company for $5 million, $10 million, $50 million in certain cases, whatever, they offer him some kind of percentage and some kind of salary to actually be the one who manages the turnaround. When that happens, when they actually do make an investment, often times beforehand when they just want to vet it, he comes to me. He sort of brings me off the bench and says, “Hey, can you help me put together a growth plan, or can you consult with this company, or can you help me do this?” So we’ve been doing this the last couple of years. The deals have gotten increasingly bigger. Recently, in the last 18 months, I’ve been paid tens of thousands of dollars to create growth plans or look at and give advice to e-commerce businesses that are doing nine figures. Literally hundreds of millions of dollars a year. And then at one case, the most recent one we did was a company that used to do $3 billion, and now they dropped out, they were bought out, and then they tanked, they went down to a billion, and then this firm bought them out of bankruptcy, to try to turn them around. So I started seeing a pattern amongst these huge… first of all, what blew my mind was that these guys aren’t doing the stuff we’re doing, James. They’re not doing segmentation, they’re not doing email marketing, they’re not doing conversion rate optimization like on the kind of level that you would expect of a company that size. That sort of nimble granularness that we get into as six, seven-figure business owners is not being experienced on the larger scale. What’s interesting is when you apply it to a larger scale, it works even better. That’s all I’m doing, is applying all the concepts and stuff we talk about to bigger businesses. And so I noticed one strikingly similar sort of outlook on the business that was a viewpoint that I didn’t share until I noticed this pattern. What it was was the idea I had about my businesses was that either a campaign worked or it didn’t. If it didn’t work, I turned it off. Basically, ‘Hey, this isn’t profitable within a couple of months.’ Off. The way these people are looking at their businesses is all channels combined. How are we doing? Are we profitable at the end of the year with all channels? And they might have three channels that are always losing money on the customer acquisition side. But then, over the holidays, when they run a sale to their past customers, some of those customers came from channels that they lost a bunch of money on but then added to their revenue because they became a repeat customer nine months later. So this idea of having one channel that’s very profitable, like for example, I have a business right now that will do $1.2 million in revenue on Amazon this year with a very high profit margin, and all of that profit I’m reinvesting essentially into buying customers off of Amazon even though it’s not profitable. But in the aggregate, I’m very profitable when I’m acquiring customers that I can then remarket to and have holiday sales to and things like that. So I’ve been able to scale that company by 100 percent just by changing the outlook and taking the profit and reinvesting it into a channel that I’m not able to be profitable on even on day 30, but eventually I’m able to create profit on. James: So it all comes down to knowing your lifetime customer value. Ezra: That’s it. That’s it man. James: Jay Abraham really impresses this in his masterpiece called Mr. X. Most businesses don’t know what a customer is worth to them, so it’s hard for them to understand their acquisition cost. James: I think it’s actually called “Schram-KOed”. Ezra: Schram-KOed, yeah. That’s actually much better. But really take the time to re-engage our past customers and engage our prospects with high-quality, relevant content. So multiple touch points of engagement. And then what happens is they’re so much more responsive to our offers because they don’t only hear from us when we want to sell them stuff, you know? James: Well, I think you said it before, you’ve removed the douchey parts, which people were doing. I call that the clubbing the baby seal technique, you know, where you’re whacking them over the head repeatedly with upsell, upsell, upsell, upsell, upsell, cross sell, down-sell, down-sell, down-sell, nag screen, exit pop. It’s like, come on guys, that’s enough. When you remove those things, and you take a more of a lifetime customer approach, and you feel as though you’d like to have a long-term relationship with this person and make it easy for them not to hate you, they are always just sitting there for you to grab again. These days, like no other time, you have tools available that allow you to not be so damn desperate and greedy. Things like remarketing allow you to be able to contact someone who visits your website or a particular page on your website, and for you to start that conversation again and pick up where you left off. Much like when we talk, like we’re not talking every morning and every afternoon. We might speak each week, every couple of weeks; but when we talk, it’s like we pick up where we left off. We’re still friends, we still have the context. So it’s not like you have to conclude all business in one transaction these days. It’s an ongoing conversation, and that’s what I think you’ve been doing really well across your brands. Ezra: Yeah. You know, the average adult right now consumes from 194-plus channels according to Facebook’s data, so that’s like Gmail, YouTube, iTunes, Instagram, Facebook, etc. So they have 194 input sources, ways they’re consuming media on the internet. And the average conversion on Facebook happens across 19 days. So like, what’s happening is the conversion process is stretching out. It used to be, when query-based traffic was the only way you could get people to know about you that conversions happened much quicker. But now, there’s a lot of touchpoints before an actual conversion event, and if you can understand that and figure out how to measure that and have conversion assets in place like email sequences, and retargeting ads, and post-purchase follow-ups, and cross sells, and upsells, then you can really build a brand of value, that’s not just sort of a one-hit wonder. James: Well, there’s a couple of ideas you’ve put out there. I think we should make some of them practical. I’ll start with an example, and then you can trump it with a significantly more impressive example, alright? Ezra: Alright, we’re going to one up each other? James: No, it’s going to be easy, because mine’s so insignificant. But I want to represent the everyday man, right? They’re not doing 25 million dollars a year. I’m not doing 25 million dollars a year. James: The last job I had, I ran a 50 million dollar a year business, and they would consider 700 thousand dollars profit a win for the year. Ezra: For sure. We’ll do more than that, but I mean, margins are not what you think they are. James: People look at a Mercedes-Benz dealership, and it’s super impressive, it takes up building blocks, there’s 70 people in that thing, there’s 15, 20 million dollars’ worth of stocks sitting around. And by the end of the year, the average dealer makes two percent profit. It’s not a lot. Like, a million bucks from 50. So I’d just like to put reality in there. If you’re dealing with stock, staff, land, buildings, advertising, the business can get a bit tough, and that was my learning ground. But just my little, tiny example is this – yesterday I wrote an email, I sent it out to a segmented customer base. So one step before that, I sent to my main list an email saying that I’ve got some new stuff coming, if you’re interested, click on the link. For people who clicked on the link, they got put into a segment. And that was determined by if they visited a particular page on my website. So I’m just talking a little bit about how this works. I’ve asked people to put their hand up if they’re interested in receiving this information. For the people who visited a certain page, they got tagged with a special tag saying, ‘interested,’ and that created a sublist. Now, I start sending the emails to that sublist. In the email, I might do something simple like I’ll say, hey, blah blah blah blah blah blah blah, and I’ve got pictures in it, I’ve got some other links they could go and visit. And in the end I’ll go, I made you a little video, and I’ll put a screenshot of the video. And then they click on that, it takes them to my Facebook page. On the Facebook page, they watch the video, and under the video’s a link they can go and visit if they’re interested. And I just did that last night. This morning, I’ve already got over a thousand views of this video. So this enables me to start running some little ads to the video. Ezra: From people who are super interested. James: They’re not just mildly interested, they are unbelievably interested. And they watch the video and they go to the link under the video. 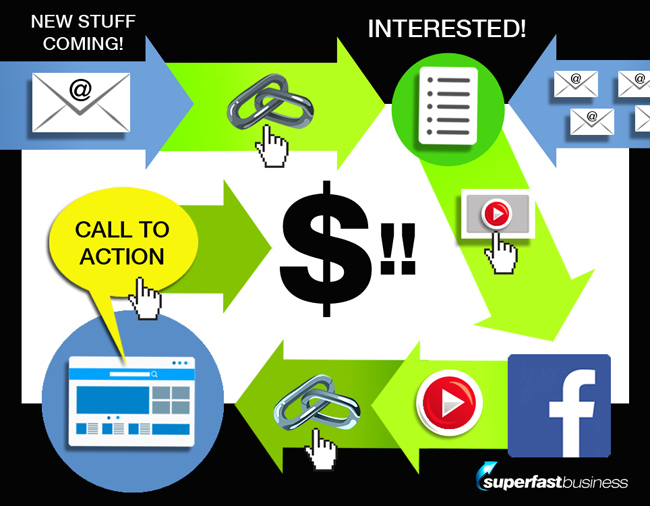 The video link goes to a page that even refines the message even more and has a specific call to action with an incentive, and then some people go and click on that, and make a purchase of a couple of thousand dollars. So it’s not an insignificant sale, but that all came from this larger list, to a smaller list, to a specific video, to a page describing the offer, to the end offer. And that’s actually what I consider the start of the relationship. Ezra: And they’re all going to end up joining your mastermind. James: Well, look at James Reynolds, who bought my SEO business. He was sitting in a room in Dubai watching a presentation I did, had never really been in the online space. This was in 2009, I think. He went from that position to buying what I was selling, to doing what I told him to do, to being my best customer, to being the biggest buyer of anything I’ve ever sold, I think aside from maybe my house, maybe, it’d be a close call. And that just came from very targeted, specific performance-based conversation, to the next conversation, to the next conversation. So that’s my little, tiny example. Ezra: That’s not very tiny, buddy. A little, tiny example that took you seven minutes to explain. If you have an iPhone, and you can load a video to Facebook, and you can run a little campaign to either custom segment of your email list or a lookalike of your email list, you could boost them with some ads. If you send an email to people asking them to go and look at it, and if they visit a certain page where you tag them in your CRM system, you’ve got several things there that are very powerful. You’ve got video metrics that you can analyze to see what they respond to; you’ve got comments and shares; you’ve got remarketing for both the page they visit and the Facebook; you’ve got the email segments of people who you know are hot for the things that you’re talking about. And that is just from having a simple CRM system, a website, an iPhone, and a Facebook ad account. There’s four elements that you can use very powerfully for just about any message these days. Ezra: Yeah. And I think combining the behavioral data from all of those places and then using that to your advantage is the future of marketing, essentially. And you know, one of the ways that we’re doing this would be like, OK, we’re going to have a holiday sale. And we send an email to our buyers, we send them an email about this holiday sale, and then we also have a Facebook ad that’s going to our Facebook fans and anyone who’s visited our website about the holiday sale. Now, we set up what’s called a custom combination custom audience. So in Facebook, you can create these things called custom audiences, which are groups of people who’ve either visited your website page, or who are on your email list that you’ve uploaded. They also now have one that’s called a custom combination. And so this custom combination, what we would do is we’d create an audience that’s people who visited the holiday sales page and did not buy. And we have a specific ad with specific messaging that’s saying, Hey, you’re either a fan, or you’ve visited our website, or you came from an email, and you visited our holiday sales page, but you didn’t make a purchase. And so we follow up with them that way. And that’s worked extremely well for us. Another thing that we do is like, people who open the email but don’t click the holiday sales message, we re-email them. And this is all basic stuff, you know? You can get more advanced with it, where let’s say you’re running an ad that is a video. One of the things we do, which I’ll get to in just a moment, but I just wanted to remind myself, actually, but we run an ad that’s a video. And if you consume 50 percent, 25 percent, or 50 percent of our video, we retarget you with content to engage you again with content before we try to sell you something. If you consume 75 or 95 percent of our video, we retarget you with a specific product offer. So based on how much of the video you consumed on Facebook, you get a different retargeting message. So we’re using that data about what you’ve done to communicate with you more sort of specifically. And that’s been really, really powerful; using behavioral data to communicate with people specifically, in all areas of the business, wherever you can figure out to do it. I just gave you a couple of examples. You gave a couple of examples. But fundamentally what we’re talking about is using behavioral data to send the behavior data back to your CRM and your ad system to talk to people based on what they did or didn’t do. Ezra: Yeah, “Hey, thanks for visiting our website, please like our fan page.” Everyone will tell you, never buy likes. Well, let me tell you what, every one of my sales campaigns is most effective to my Facebook fans. And guess where my Facebook fans come from. They come from retargeting people who visit my website, you know? James: They also tell you not to be spooky and let people know that you know, but you break that rule, too. Ezra: Yeah, I do. It’s working out incredibly well. James: Sounds like it’s going alright. I mean, look, I’ve made a living off being a contrarian, so it’s music to my ears. I love it when you’ve done something different, and hey, it actually works. I think people would love to have you convinced that whatever they tell you is absolutely the gold standard, you know, like $1 per email per month, all that sort of stuff. We know they’re not realistic for us. Dare to do something a little bit differently. Let’s just do a little stock count of where we’re at, and then I’m going to ask you what that thing you wanted to tell me is. First up, when you’re starting advertising in campaigns, just allow for a little bit of research and development before you find your winners. Have an understanding of how much a customer’s actually worth, so that you can calculate how long you can let an ad run until you know that it’s winning or not. And it could be months until you get your return. Be relevant at all times. Super-segment. Have a win back campaign when you recognize that someone’s about to slip out of that repeat purchase cycle, you make sure that you have a specific targeted follow-up campaign, and Ezra mentioned that he’s doing that at 60 days. Have lots of conversion assets. Forget the old model of a single page that you drive everyone to with the same offer. We already know that when they come to those pages we should be using a chooser or a segmentation to find out what their biggest challenge is, to move them into the right stream or bucket or conversation for them. That’s exactly what we do in real-life selling, is we ask questions and then tailor the solution to whatever they tell us. Now, everything, a Facebook ad, a video, a landing page, a PDF, Pinterest board, a Twitter account, Instagram, all these things are able to communicate with each other using behavioral devices. Looking at how long people watch videos for, which pages they visit, we can now tailor the conversation. Ezra gave a great “bought X but not Y” sequence. That’s a simple sequence you can put in. I imagine another very simple sequence that everyone must have would be a shopping cart abandonment sequence, which I absolutely, certainly, certainly have. Ezra: Oh my god, huge one. Let me give you a stat on that, OK? James: I imagine for most people, that would have to be a 30 percent bump instantly. Ezra: Oh my god, it’s so big. And the stat that I’d like to share about this is, across all of our email sequences, email automation sequences, where someone gets put on an email, and we get their email somehow, it’s a cart abandonment or pre-purchase or post-purchase or whatever… Across all of those, we’ve done about 1.9 million dollars in revenue, just from those. And the average value per email recipient is about 70 cents, OK? Now for the cart abandonment sequence, the value per recipient is $3 and 30-something cents. So it’s like, quadruple the value of any of our other email automation sequences. James: Right. And another stat that you shared with me once that I thought was interesting and I definitely implemented on, which is one of the benefits of hanging around smart people every week, is you said that the search box impacts the transaction value. Can you explain that one? Ezra: Yeah. So basically, you know, the stat that I like to share here is that on one of our sites, only five percent of the visitors actually search. What we noticed, I’ll tell you how we noticed it, we had the search box in the left-hand menu. If you know about e-commerce sites, you know a lot of them have left navigation menus that go down the left-hand side of the page, and we have the search box sort of at the top there, and we have this tracking that tracks how many people are searching, what they’re searching for, the value of people who searched versus didn’t search, stuff like that, which is easy to do in Google analytics. And we found that two percent of people were searching, and 10 percent of our overall site revenue was coming from those two percent of people. So we thought, how do we make more people search? What if we did what Amazon, and eBay, and all these other big retailers seem to have figured out, and stuck a giant search box at the top of our website? Well, what happened was, the search volume went from two percent to five percent. So now five percent of our total visitors, and this is a multi-hundred-thousand dollar per year business, five percent of our total visitors were searching, and 30 percent of the website’s revenue was coming from those five percent of people. So it’s sort of that commitment and consistency thing, where if you can get people to take an action, they’re more likely to take another action, so we increased the number of people who searched, and therefore increased the number of sales we got significantly, because we were getting more people to search. James: Man, you should just make a white page and put a search box in the middle. Ezra: Yes, they did that. That’s genius. I never thought about that. James: Yeah, they’re searching for something, and then they’re getting displayed relevant ads around what someone searched for. They are like the world’s number one survey response mechanism. James: So, well, been interesting. Now what was the thing you wanted to tell me? Ezra: Was there a thing I wanted to tell you? Ezra: Oh, well, I forgot whatever that note was. James: Oh, you are the biggest tease. Ezra: I’m sorry. I think maybe I covered it already. James: Right. Easy out. Easy out. If you think about it, we’ll have a Part Two. I mostly wanted to have this chat because you just happened to mention that you went from four million bucks to 25 million dollars a year, and it really begs the question why. I mean, I just want to finish out by proposing a little scenario. Let’s say I’ve just started my first little e-commerce store, let’s say in the last month. I’ve got a little bit of a brand, I’ve got a few products for sale, I’m testing the market, people seem to be interested in what I have to sell, I’ve made a couple of sales and I’ve started shipping my goods – what can I take from the lessons that are on this podcast? Ezra: I mean, I think you can take a lot of the behavioral stuff, a lot of the email sequence stuff, but what I would say is, pick a couple of channels that you think are going to be really successful for you. So perhaps that’s listing your product and marketing it on Amazon, perhaps that’s setting up a little Facebook ad campaign, perhaps that’s even traditional Google AdWords search, or maybe it’s YouTube videos. Don’t pick more than three channels, because my experience has really been that any more than three projects is more than I personally can handle. So pick three channels, and invest time and energy in the direction of all three, and then whichever one is working out the best for you, transition for a multi-month period into 100 percent having all of your time, energy and effort invested in that one visibility channel. Because at the end of the day, e-commerce is really going to come down to your ability to generate visibility for your products in a profitable manner, and if you can find a channel that is showing some signs of life, then that’s where you’re going to want to put your attention. Ezra: I think. I mean maybe that’s not true, but that’s sort of been my experience. James: Well, I’m just talking about benchmarks. So if we have a small store, and we’re just starting, we don’t really know these things yet. So we know we need to buy something and sell it for at least three times what it cost us to buy, right? And then we need to allow whatever it cost us to buy in marketing budget/team costs/shipping or whatever other costs we’ve got to absorb, is that right? Ezra: Yeah. And you know, it used to be that in the drop ship world, right, like my margins were even thinner when I was drop shipping, but traffic was cheaper and it was nine years ago, you know? And now that sort of things have evolved, especially if you’re just getting started, you want to give yourself that room. If you’re literally buying for 10 and selling for 20, I didn’t know how you’re going to make it, unless you’re getting free traffic, unless you ended up with somehow or another someone endorsed your brand, and you got a whole bunch of sales from some football player wearing your bracelet or whatever, you know? If you’re getting free traffic, then hey, all power to you. But if your plan is to invest in creating the visibility through content generation and amplification or direct response ads, then I just don’t see how you’re going to make it without a 3x. James: Right. What are some other metrics we should be looking at? Like what could we expect if we add a shopping cart abandonment sequence where we don’t have that in place already? Ezra: Yeah, I think you can very healthily and reasonably expect to recover one in 10 carts, and if you’re doing it really well, and the way that I would suggest doing it is using a discount ladder, where the first couple of emails do not offer a discount, but then the next couple of emails start to offer a discount and increase that discount over time, you can get to three out of 10 carts recovered, so 30 percent additional sales, essentially, which is about what we do. Ezra: Yeah, and I think with a post-purchase one-click upsell, you can expect an immediate 10 to 20 percent increase in your average order value, like day one. James: Let’s say I give you a store, and I give you a Facebook account, and you got a customer list. What’s the first couple of campaigns you’re going to run? Ezra: First thing I’m going to do is run a discount sale campaign to that customer list. The second thing I’m going to do is upload that customer list to Facebook, and I’m going to resell to those customers, I’m going to create a campaign, the content and video, and some kind of offer, maybe an additional product, and I’m going to make money from the asset that already exists, and I’m going to use that money to spend on acquiring new customers. James: Perfect. Do you put more focus on the ones who bought, or the ones who didn’t buy? Ezra: The ones who bought, for sure. Times like, 15. They’re like, way better. Ezra: For example, we have a prospect list of 189,000 people who have never purchased from us. And we’ve got a customer list of maybe, it’s 150,000, smaller. And we make, as you might imagine, like 95 percent of our sales that are happening from lists are coming from the people who have bought from us before. Because if you’re on our prospect list longer than 30 days, and you still haven’t bought from us, it’s really hard to convert you. Ezra: Yeah, well, we’ll upload them into Facebook, we’ll run some campaigns, we’ll amplify some content to them, you know, we’ll try. Ezra: Fifty of my customers at Smart Marketer make up 45 percent of our revenue or something like that. I mean literally, between 50 and a hundred people of 35,000 or something. So it’s incredible. And Boom is the same way, we have these hyper buyers who just keep coming back every three months, and they make up a good 25 percent of our entire company. It’s incredible. James: Right. And so all customers are not equal, we really should stop trying to average out our campaigns, just prune always for those super, hyper segmented customers, have an incredibly relevant conversation, and have a way to tell if we’re getting in their face. And things like surveys, etc., they really do help, and having people put their hand up to show you that they’re really keen for more, and I guess you’re being responsive with them, you’re asking them things. But you know, the little tiny sublists that I created recently for my people who are interested? The open rates on that stuff, they’re just off the charts. Ezra: Through the roof, right? James: Yeah, they’re just through the roof. And like they’re saying, “Yeah, not only am I interested in this, like I’m rabid, keep sending me stuff.” I’ve had no opt-outs, and I’ve had no complaints from that sublist, not one, which is really unusual. Normally I expect one or two. James: But they’re super, super targeted, and I was very explicit about the promise that “This list is for this particular topic,” and they’re saying, “Yes, please, send it to me.” And a lot of people have resistance to market to their customers because they’re worried that they’ll get rejection or that people will complain. Well, they won’t if you’ve been straight up with them about what they’re getting into. Ezra: Yeah. And also, they have the option to unsubscribe. Ezra: That’s no big deal. So they say, “Hey, I don’t want to hear from you anymore,” and they leave. And that’s OK. That’s an OK outcome. That might happen sometimes, you know? James: So to wrap it up, hypergrowth from four million to 25 million, what would you say is the one-sentence summary of what’s caused that that you would want to pass on to someone if you had five minutes with them over a kombucha or whatever you drink? What would you tell them, in just a short sentence or two? Ezra: No, I’m just kidding. I would say that it’s an iterative process, things are always changing, and the only consistent thing that you can control is your own attention on your business. This is year five to six, OK? So I’ve been doing this five years. It’s likely that many of you listening to this have not stuck with a business project for that long. So you maybe have bailed early, it’s a common thing. So I would say, show up every day with a positive attitude, and a desire to grow, and be nice, and have a good time, and do what you’re doing right now, which is put good information in your path, and test stuff out. You just got to keep at it. You got to stay consistent. It’s like surfing, it’s like jiu jitsu, it’s like business, it’s like relationship. The key really is to show up consistently, and what will happen is you pick that instrument up, 30 minutes a day; you’re going to get better at it. And so, I think really the special secret is the consistency. James: Thanks Ezra, it’s been great to catch up again. Ezra: Yeah, man, loved being on the show, thanks. James: See you in a few weeks. One of the best podcast eps of 2016 I’ve listened to, congrats on the growth so far (setting the standard in ecom). @JamesSchramko:disqus Do you know any Aussie marketing events between now and your next one? @boombycindyjoseph:disqus With your attractive character for BOOM, what type of partnership deal did you start out/continue with? Did you pay for her time initially or partner straight up with a % of rev/equity? Keep up the fantastic content guys – appreciate your time. Hi Stephen I’m going to Ezras event in San Diego and I think he is live streaming it. 2) I might hold a small workshop with Dean Jackson next month. Email me if you are interested. @st@stephenesketzis:disqus We’ve been business partners since the onset. Awesome episode James and Ezra! True masterclass by itself. What’s the real win for Unilever acquiring DSC customers at $285 or so each? It’s probably more the team and the systems? Hire Interns Or Permanent Team Members?